The modular garage featured at the left is one of many examples of what is available today in the prefab garage marketplace. The nice thing is - they can be delivered to your site and set-up in usually just one day without all the noise, fuss, mess and waste that accompanies the stick-built version. These prefab garage units are built in factories and their components are protected from the weather during assembly. There is no exterior priming or painting to do, as that is all completed before the unit goes on the truck. Dollar for dollar, these units provide a nice advantage to the owner that wants to save valuable time and money building a prefab garage or workshop on their property. Modular factories are located in nearly every state and province of North America. Many build prefab garage and storage sheds, and some even build modularized components for housing that are shipped as separate rooms ready for installation and use. 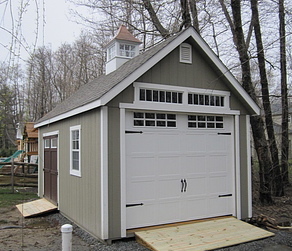 The modular garage often comes with a treated wood structural floor in lieu of concrete and can be set onto your site over a bed of gravel that has been leveled. If you are considering this approach, check with your local building official to see if they will allow a non-foundation structure or outbuilding in your jurisdiction. In the U.S., some rural county jurisdictions will allow this and don't require a building permit or inspections for this type of structure - but check first! Most municipal law jurisdictions (incorporated cities) require a permit and some type of concrete foundation system even for non-human habitation buildings such as a prefab garage or workshop. Still, the prefab garage featured above can be assembled on a concrete foundation to meet whatever legal requirements you find yourself subject to. 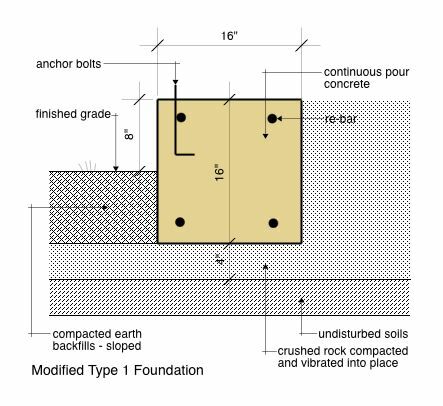 If you need to provide a concrete foundation under the walls in your jurisdiction, it is still possible to use the structural wood floor system that comes standard from many modular manufacturers and save the cost of the concrete floor. If you study our pages on garage foundations you will get an idea of what is possible. You could simply leave the floor slab off of a Type 1 Foundation and fill the interior with crushed-rock after you strip your forms. The structural wood floor would sit on the crushed rock and the walls would bear on the continuous concrete foundation beam as shown in the Modified Type 1 Foundation above. This same approach will work with any of the foundation types that you may be required to use in your local jurisdiction due to frost depths or poorly drained soils. These structures are also available in two-halves if you are planning a two-car prefab garage for your property. They come in maximum widths of 14' pairs and are mated-up on your site to form a whole. They can usually be set-up and ready for use in under two days. The modular garage falls into the category of the factory built prefab garage when it is delivered in one or two pieces, ready for setting into place on your foundation, and zipping-up if it is composed of two pieces as for a double garage. The beauty of this system is that there are factories within 200 miles of most of the population of the U.S. and Canada. All-in-all, the modular garage is a great value from every standpoint considering there is little or no waste, and the fact that they can be up and useable in very little time.